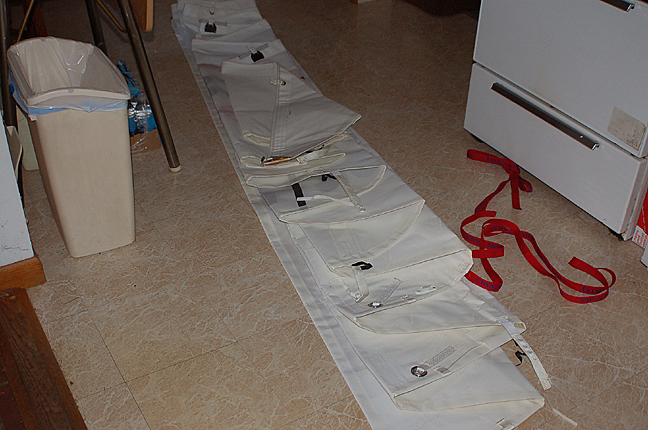 In a casual inspection, everything seems to be as-ordered: The sail numbers are correct (3282), the two sets of reef points ordered are there. Ideally, I'd like to spread it out, look over the sail as a whole -- see more of the details. But that's not going to happen for a few months to come, so I did the best that I could. 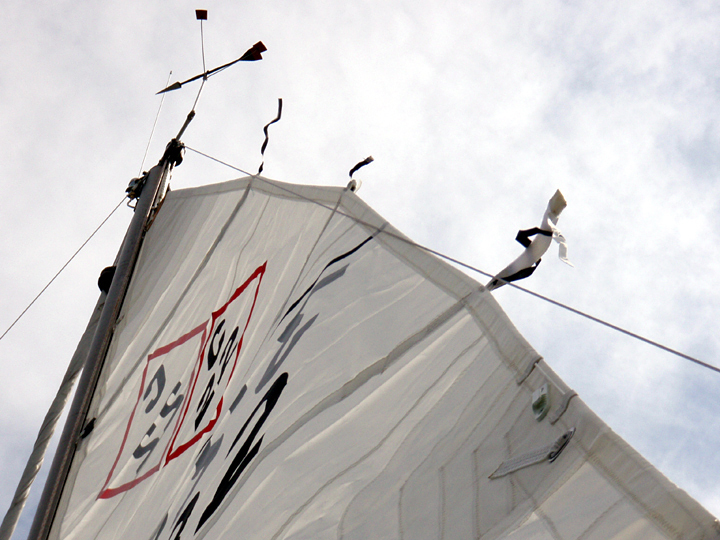 I was going to wait until spring to inspect it, but this morning on the discussion group, Jay Holz ("CjAndeai") advised: "Open that new sail! 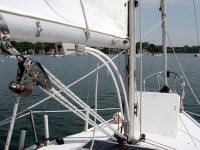 Check it out good now before the sailing season, just in case there's a problem." I thought that was smart advice, even if my capability is presently limited, considering my usual luck getting the one bad piece from a lot. Jay added: ". . . many of us need to know what your first impressions are." 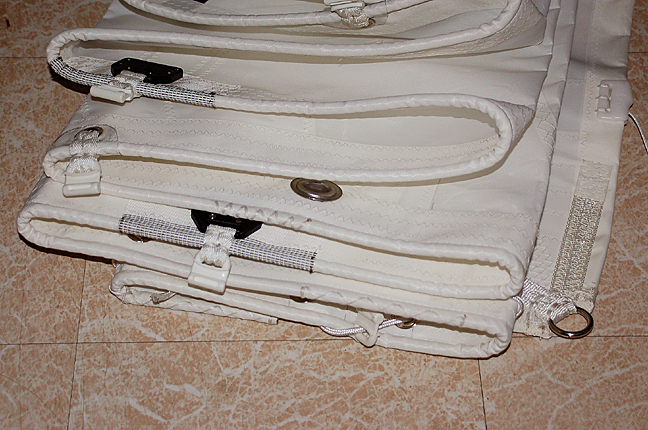 My first impression is -- quality and good workmanship. 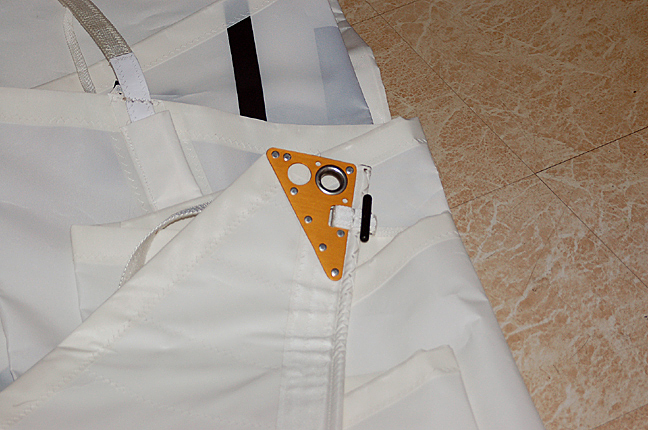 The little details I inspected were stitching and reinforcements: They both look very well done. 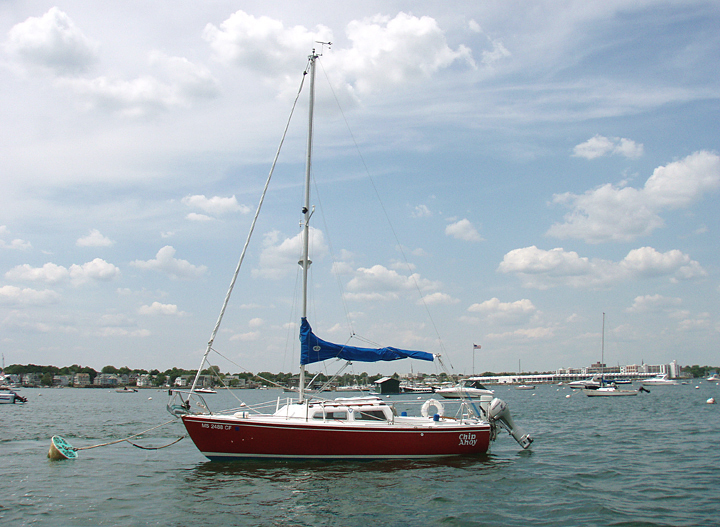 Configuration -- how it'll fit on Chip Ahoy's mast and boom -- will have to wait until spring. 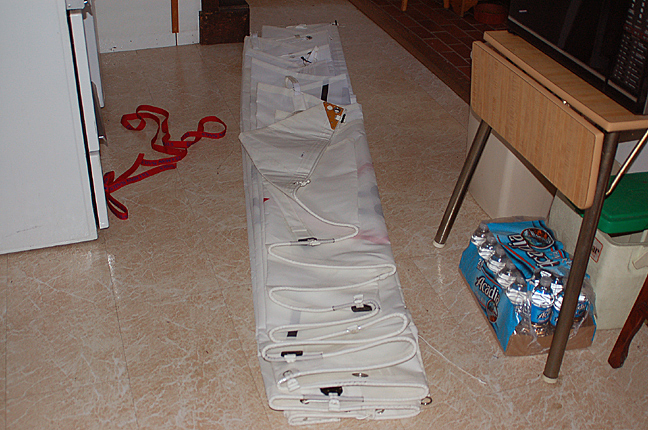 From everything I was able to eyeball as I carefully unfolded the sail in limited space, this looks like a quality sail -- and what a difference in stiffness from my old (original with the boat) mainsail. I'm anxious to try this "loose-footed" concept -- entirely new to my experience. As with the rest of the workmanship, the headboard seems to be attached quite securely and provides everything I'll need. All and all -- upon this cursory kitchen floor inspection -- I love it so far, am satisfied that I got what I ordered. 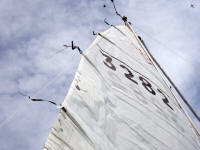 Come spring and raising it up the mast will be the next test. 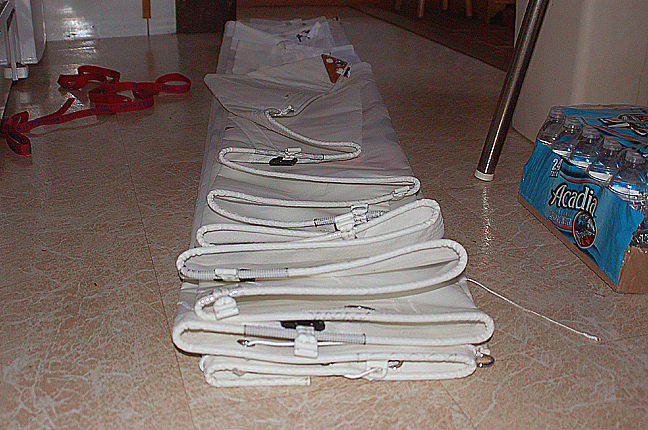 Sail in bag is now stored away in the closet until then. 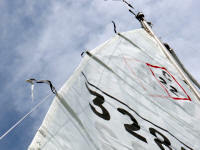 The mainsail isn't hauled quite all the way to the top of the mast, yet still the roach in the leech is hitting -- not just at the third batten down but at the second down as well, and touching the top batten. On Monday I'd lowered the boom by about 4" to where its top was now about 3 feet 2 inches above the mast step. It's needs to be lowered considerably more. A view of the problem from the port side. At a minimum, without more adjustment the edge of the roach isn't going to last long without wearing through the batten pockets. 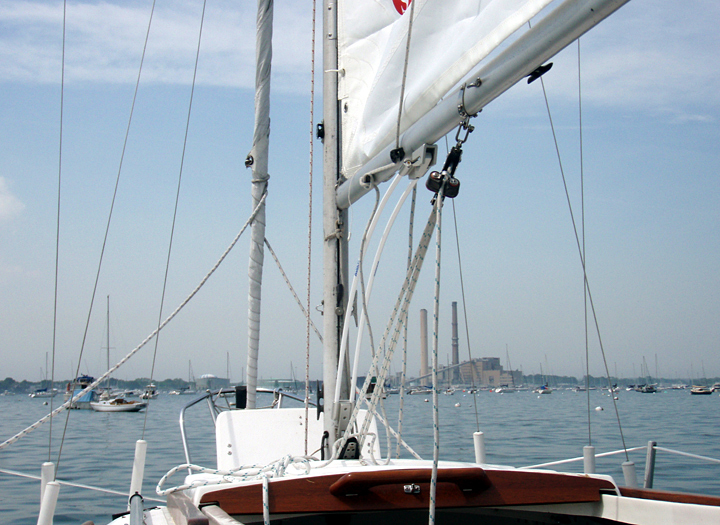 Worst-case scenario: An unexpected gybe I think could potentially take out the backstay and bring down the mast. When we prepared to fasten and mount the new boomkicker on Monday, first the boom was hung. 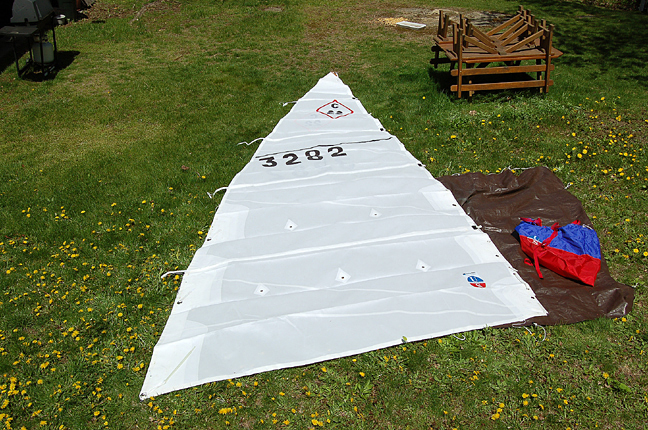 I used measurements based on instructions provided by its manufacturer, Seoladair Ltd., as well as additional tips and advice from other C22 owners' websites, to drill and tap the three holes in the boom's bottom for the kicker's top bracket. When we attached everything all looked fine, as it was supposed to look. 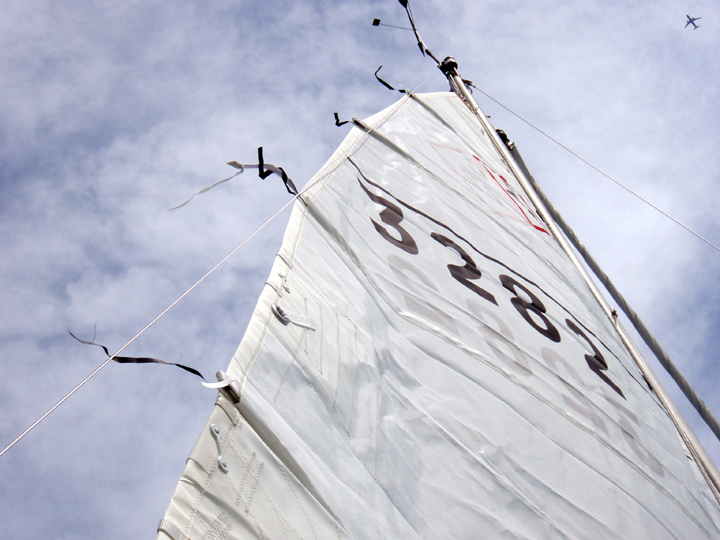 The problem now seems to be that the boom is too high even based on the measurements we used: Boom height, 3' 6" -- boomkicker bracket 10" above the mast step. 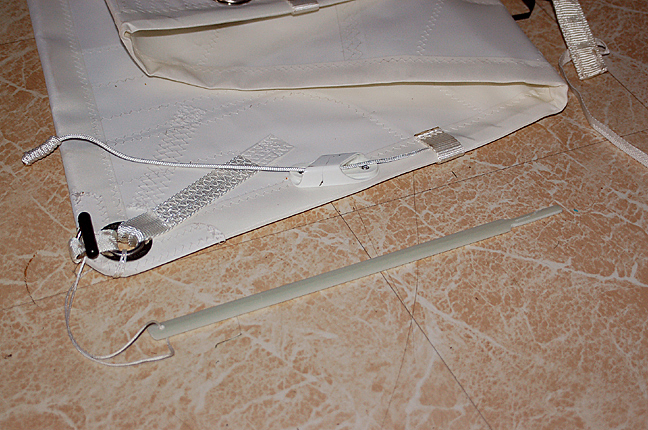 I lowered the boom but doing that overly bent the fiberglass rods on the boomkicker. The increased angle caused the vang's block to rub against the front edge of the solar panel. When I had this problem previously, I cured it by adding a shackle between the vang's block and the mast step plate.